Maximum potency for a fantastic price! Vitamin C is one of the most important antioxidant vitamins. Besides that, its antioxidant qualities are important for post-workout recovery and especially for fighting free radicals. Why Vitamin C from Firm Foods? 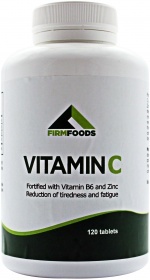 Each Firm Foods Vitamin C pill contains 1000mg of Vitamin C fortified with Zinc, which contributes to the maintenance of healthy bones, and Vitamin B6. Don't lose the opportunity to get stronger with 120 pills of the most potent Vitamin C on the market. Choose Vitamin C from Firm Foods! Have a question about Vitamin C 1000mg? What is it, what does it do, how and when to use or something else? Ask us. After you put them into your mouth it immediately starts to melt and very difficult to swallow. Usually i could swallow 3-5 pills in one time but this one is the worst i've ever tried. Not recommended. “Vitamin C 1000mg 120 tablets” is currently out of stock. Enter your details below and we will let you know when it's back in stock. As a dietary supplement, take 1 tablet per day or as directed by a healthcare professional. WARNINGS Vitamin C 1000mg : Do not exceed the recommended daily dosage. Keep out of reach of children. Food supplements should not be used as a substitute for a varied and balanced diet and healthy lifestyle. Store in a cool, dry place. Please Recycle. BEST BEFORE: Please see lot number and expiration date stamped on the packaging.